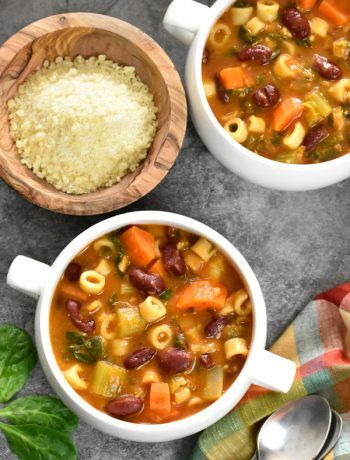 A dump-and-start recipe for Instant Pot Minestrone Soup! 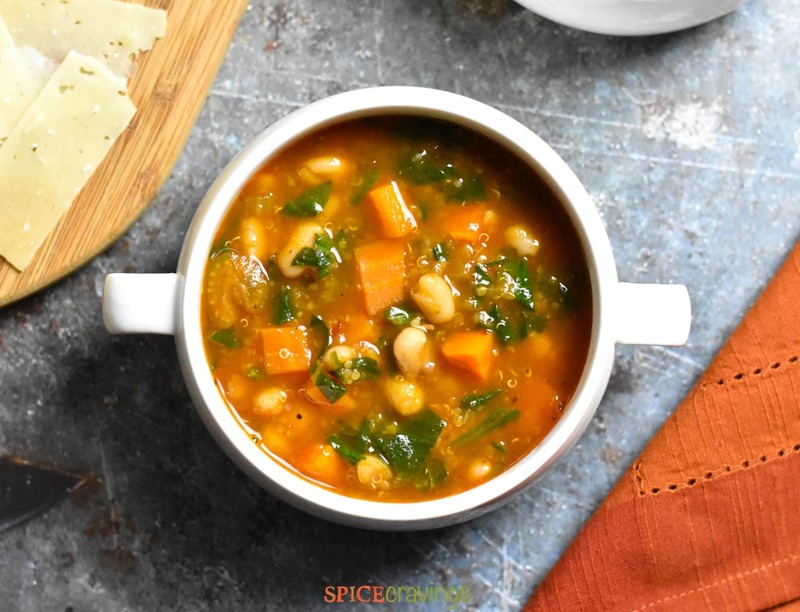 This tasty and hearty Italian soup is a delicious blend of vegetables, herbs and fiber-rich beans simmered in a tomatoey broth. I add quinoa instead of pasta, to boost the protein and make it gluten-free. 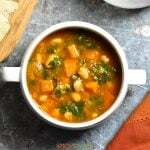 Minestrone Soup is an Italian vegetable soup, traditionally made with root vegetables, like onions, celery, carrots, and vegetable stock, dried herbs, beans and tomatoes. It is mostly vegetarian and often includes a grain like rice or pasta. 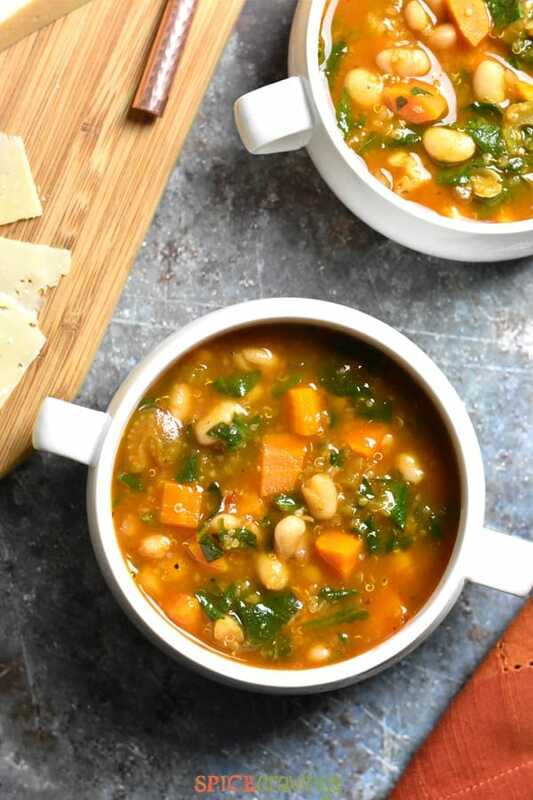 This version of Instant Pot Minestrone Soup is one of easiest, tastiest and healthiest soups that you can make in a flash. It’s a great one-pot comfort meal for my family! 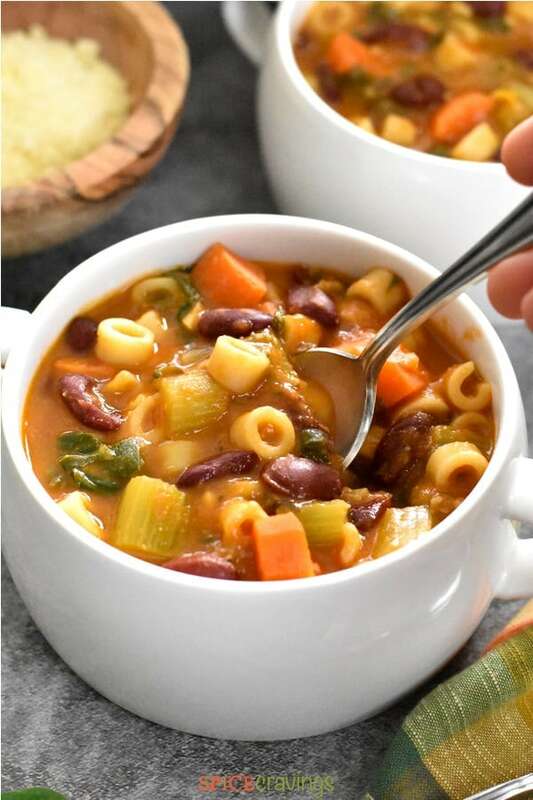 If you enjoy Minestrone soup, you will likely also enjoy this Pasta Fagioli soup. Instant Pot Minestrone Soup is part of my ‘dump-and-start’ instant pot pressure cooker meal series. 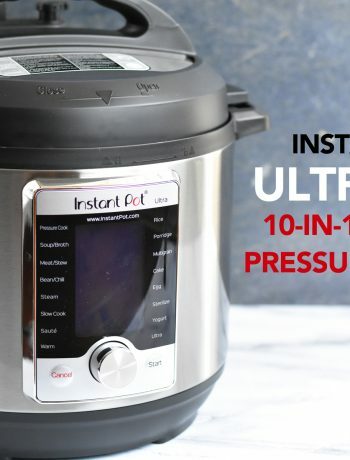 All you have to do is add all ingredients to the Instant Pot or any electric pressure cooker. Close the lid and set a cook time. The pressure cooker does its magic, and in under 30 minutes you get a meal that tastes like its been simmering low and slow for hours. 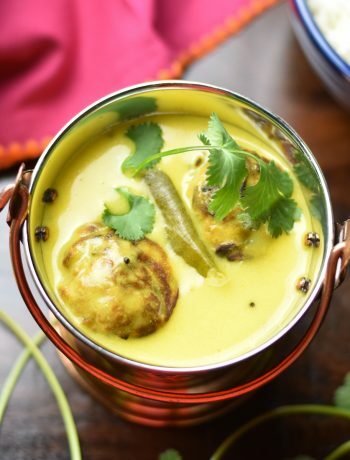 This recipe is on rotation in my house for weeknight meals. It’s a lifesaver! I have always noticed how our meals often reflect the colors of the season. 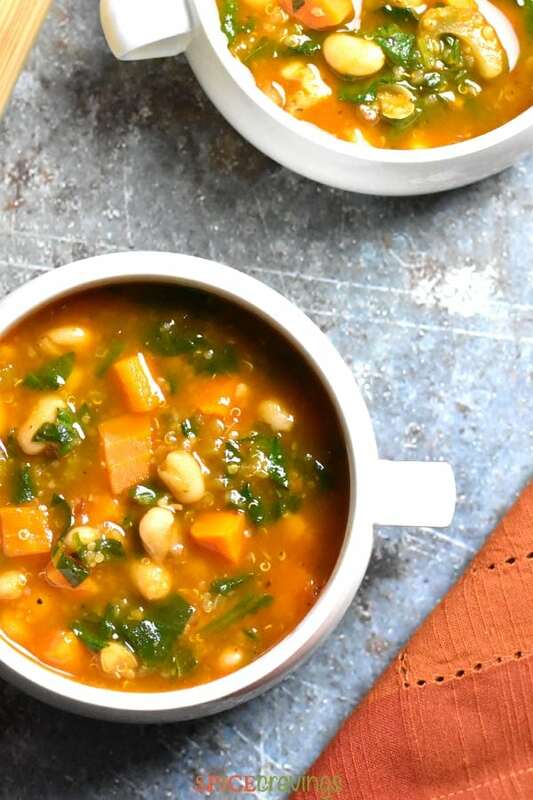 This soup certainly screams Fall– a colorful blend of orange, red and green, it is also a great comfort soup to have on a cold and chilly evening. Veggies: You can easily customize this soup to your taste- I keep switching the veggies in this soup. Sometimes, I add chopped squash or pumpkin to this, and it tastes amazing. Beans: I prefer to use canned beans in Minestrone Soup, simply out of convenience. The time it takes for dry beans to cook is too long for the vegetables, so, if using dry beans, one has to make this a two-step cooking process- cook the beans first and then add the remaining ingredients. I personally like using organic Northern beans here, but you can use the beans of your choice, Kidney, Pinto or Cannellini Beans. Broth: I make this soup with low-sodium vegetable broth, but you can use regular broth or even chicken/Beef broth. You can add diced tomatoes to this soup. We prefer a slightly less tomatoey flavor, so adding tomato paste just works out great for us. Typically, this soup calls for a small pasta. I substitute it with Quinoa. My family prefers the taste of quinoa, its gluten-free, plus it bumps up the fiber and protein in the soup. You could even add Amaranth or wild rice instead. I add chopped spinach to this soup towards the end of the cooking process. The heat from the soup wilts it down. You can use any dark leafy green instead of spinach- chopped kale would be a great addition here too. Garnish it with chopped basil to add a floral spring-time flavor to this dish. Sometimes, I like to add an extra, totally optional, ingredient in this soup towards the end. I add chopped, pre-cooked, chicken and jalapeño sausage from Trader Joe’s. The sausage is fully cooked, so it just needs to hang out in the soup for a few minutes and it absorbs the flavors of the soup and becomes really soft. My family loves the combination of this spicy sausage with Minestrone soup, but you can skip it and make it totally vegetarian. You can cook this soup on the stove-top too. Add all the ingredients in a soup pot, stir well, and cook covered on medium-high heat for 20-25 minutes, or till quinoa grains have sprouted. Follow the remaining instructions for garnish and enjoy! Follow all instructions and cook for 2 whistles in the pressure cooker. Wait 5 minutes and manually release pressure by carefully lifting the pressure weight. This is my pressure cooker ‘pour-and-start’ recipe for Minestrone Soup. 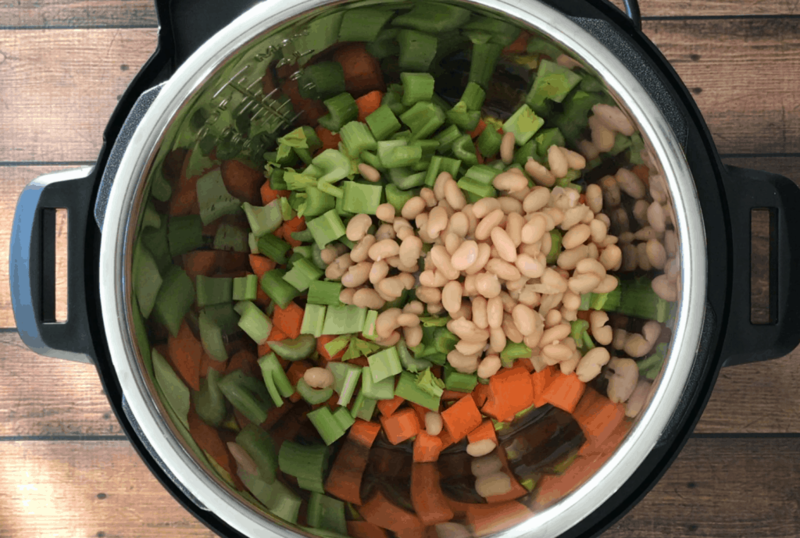 It’s delicious, healthy and a colorful blend of hearty vegetables, earthy broth and fiber-rich northern beans. 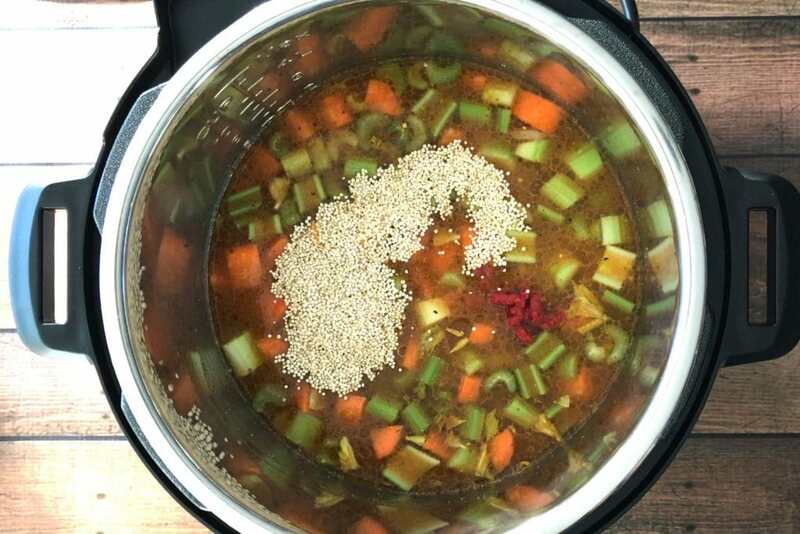 I add my own twist by adding quinoa to it, and that makes it a great one-pot gluten-free meal! Prep: Chop vegetables of your choice (I used carrots, celery, spinach). If using fresh garlic, finely chop garlic cloves. Rinse and drain canned beans. In the inner pot, add olive oil, garlic, chopped vegetables, beans, vegetable stock, spices, chili-garlic sauce, tomato paste (or diced tomatoes), quinoa (or elbow macaroni), and stir well. Close lid. Set vent to Sealing mode. Cook on Manual (high) for 3-4 minutes, depending on how you like your vegetables (I cook for 3 minutes). Wait for 5 minutes and release the pressure manually, and open the lid (which means QR after 5mins). . Stir in chopped spinach and sausage (if using). The heat from the soup will be enough to wilt the spinach and bring everything together. Garnish with freshly grated parmesan cheese and enjoy! My family loves, loves, loves this soup. We omit the salt as this soup has so much flavor it’s not necessary to add it and helps keep our sodium intake down. 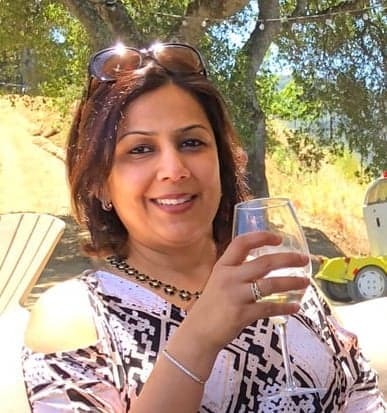 Your website is wonderful and packed full of great recipes.